Starting in the late Middle Ages, artists worked resolutely to establish themselves as thinkers and intellectuals who rivaled the poets and other men of letters. They did not want to be included with all the other artisans—carpenters and blacksmiths—but wanted to be accorded the status of practitioners of the liberal arts. Leonardo and Michelangelo believed their task to be of the highest intellectual and spiritual order, and in their work, they embodied the finest balance between thought and execution, between conceptual ideas and the making of physical objects by hand, that the world has ever seen. I have always loved working with my hands as well as my mind, bringing a physical object into existence that was previously just an assortment of raw materials. And like most people who like to make things, I have an abiding love and respect for my tools. My tools are relatively simple and straightforward. I appreciate the fact that in a time of dizzying technological change, the tools that I use each day are remarkably similar to the ones that Titian used five hundred years ago. And among these tools, one that I value the most is my palette. While I have quite a number of palettes at this point, this was my first—the one that came with my first folding French easel and which I have been painting on for over forty years. It is made out of a piece of cherry, and if you look at the backside, you will see the raw wood. But the front side has a gorgeous dull luster, a patina that comes only from constant use, like a fine piece of furniture that has been frequently polished. It is important to remember that a palette is both a physical object and a concept. It is conceptual in that it encodes numerous choices regarding, for instance, how many colors you use, which specific ones and in what order you arrange them. If you look down the aisle of any large art supply store, you realize immediately that there are hundreds of colors! How do you know which ones to choose and in what order to place them? Most painters I know working in a full-spectrum manner have between ten to twenty-five colors on their palettes—obviously, quite a range. Real estate is very limited on a small palette, so you want to think very carefully about your choices. For instance, some painters want to mix all the secondary colors themselves, so they might put out a number of blues and yellows, but not any greens. Whatever your color choices, I think it is very important to lay them out in exactly the same place every time. Once you have been doing this for a while, you will not have to waste any time looking for your colors—you will already know where they are. The palette is like a piano or computer keyboard, and you want to be able to do the equivalent of touch-typing. Imagine a pianist who needed to look for his or her notes! If you look at my palette from the side, you will see a slight “shelf” or rise beginning to develop. It is the accretion of many, many days of laying out the same color, in the same place. It is the visible evidence of work. The palette should be considered as an ensemble—an entity in which the whole is greater than the sum of its parts. It is a serious thing for me to add or remove a color. Because when you add a color, you not only need to know all about that color itself, you need to know how it will interact with all the other colors on your palette. For this reason, I lay out all of my colors, every time. I have heard students look at a subject and say, “there are no reds out there, so I won’t put any of my reds on the palette today.” But colors are used not only for themselves, but are used to enhance or mitigate other colors. If you have a green that is too intense, for instance, you might need to calm it down it with a red. Even though a dozen artists would organize their palettes in a dozen different ways, there still are some constants. For instance, most painters find it extremely useful to group their warms and cools together. All the color decisions we make relate to whether a note is warmer/cooler, or lighter/darker than its neighbor. So we are constantly weighing these colors against each other. (Warm and cool are, of course, poetic associations; warms remind us of fire and the sun, cools of water and the forests.) If you look at my palette, you will see that I have my colors in a sequence from the violets to the blues, then the greens, browns, reds and finally, yellows. White is up in the corner where I can get to it easily (You will also notice that we use much more white than any other color). *** This palette seems to make sense: it is orderly, easy to read and use. Compare this to a really bad palette, one which I pulled out of the garbage many years ago and kept as an example. What a complete mess! The warms and cools are all mixed up without rhyme or reason, the surface was never cleaned after painting, so the mixing area has been ruined, etc. etc. Exactly what your order is, is less important than that you have an order. It doesn’t matter if you have the reds on the right or the left—so long as you can find them automatically. That is why it is so hard, for instance, to cook in someone else’s kitchen; you don’t know where anything is. You know that all the silverware is probably together, as are the plates and glasses, you just don’t know in which drawer to look. As well as being a concept, the palette, as you can see, is a physical object that needs to be cared for. 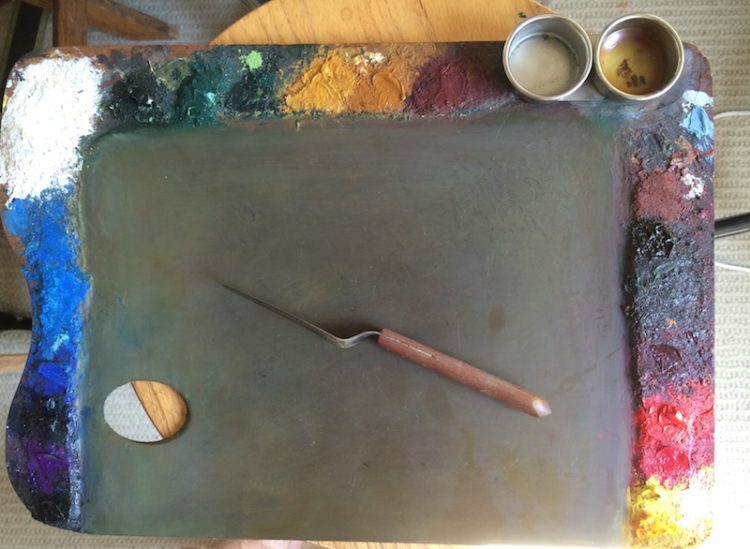 My palette is 11 x 16 in., which fits in the drawer of the folding French easel. I would find it hard to paint on a much smaller palette, because I wouldn’t have enough room to mix. (By the way, the palettes that come with the Pochade boxes are considerably smaller as well as being recessed into a well, which would be less than ideal for me. (Obviously, some people do very well with them). My indoor (studio) palette is considerably bigger. I love the additional room to mix, but would find it difficult to carry around. My palette is my ally in making paintings. 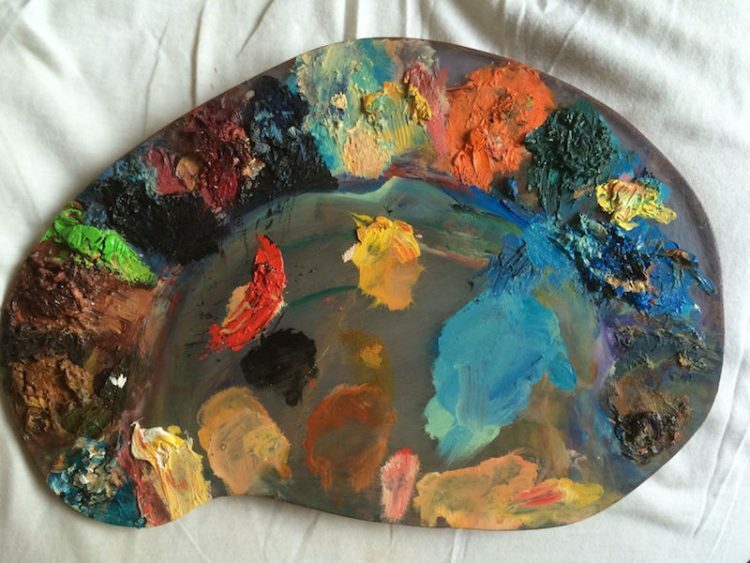 My palette has served me well, helping me make paintings, for better or for worse, for four decades. When I am having troubles, I look down at my palette and remember that I have actually painted some good paintings on it before. It has been to three continents, and it gives me strength when my confidence lags. I think that artists are basically animistic—we see life everywhere. So to me, my palette is a living thing, and a treasured thing, at that. I try and get my students to see the virtues of using a stable wood, Masonite, or glass palette, one that they will work with, get to know and with which they can develop a relationship. What kind of relationship can you have with a piece of wax paper you are about to throw away the minute you finish with it? It doesn’t always work. The convenience of disposable palettes will often win out. Other problems with wax paper palettes are that, because you set them up new everyday, you tend to lay out your colors every which way, certainly not in the kind of strict order that will allow you to learn to touch-type. Also, you get lazy and don’t put out all of your colors each time. Laziness, short cuts and convenience are some of our biggest enemies. Painting is a discipline, and requires you to get into good work habits early on. 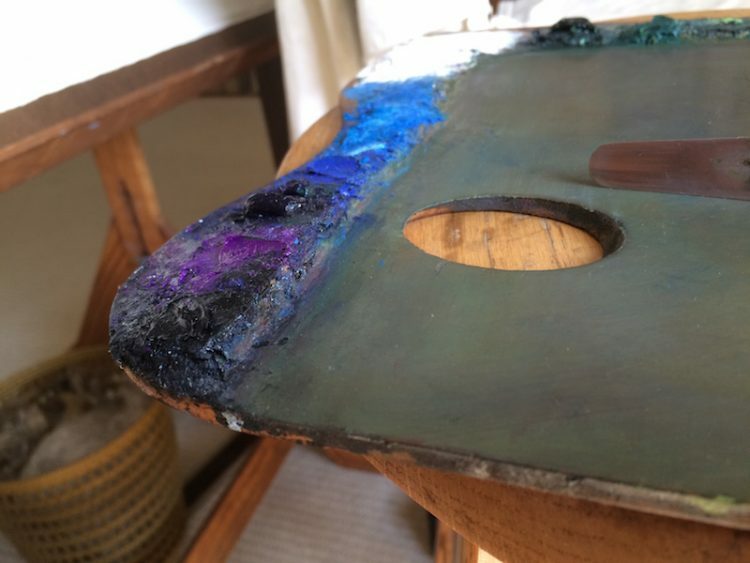 Half the time when a student is having problems in a painting, I will have a look at their palette, because that is where the troubles often begin. The palette is where you make your decisions—where most of the work is done. The canvas is the repository for those decisions. If a student starts mixing on the canvas rather than on the palette, the painting will likely start to look like a mess as well. I love looking at artist’s palettes in the museum. It is like seeing Paganini’s violin. I have seen, among others, Pissarro’s, Whistler’s, and Turner’s palettes. Now mute, how those palettes have sung! I get a chill down my spine looking at them thinking, this is where it all happened. 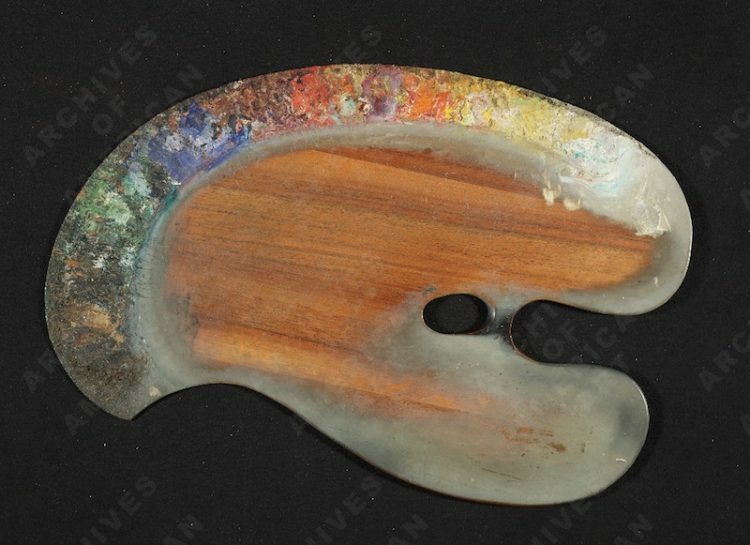 James McNeill Whistler’s palette and brushes, ca. 1889. Leon Dabo papers, Archives of American Art, Smithsonian Institution. ** My colors are, from left to right: Ivory Black, Ultramarine Violet, Cobalt Violet, Pthalo Blue, Ultramarine Blue, Cobalt Blue, Cerulean Blue, Manganese Blue, Flake White, Terre Vert, Viridian, Pthalo Green, Yellow Ochre, Raw Sienna, Caput Mort Violet, Burnt Sienna, Van Dyke Brown, Burnt Umber, Raw Umber, Alizarin Crimson, Cadmium Red Light, Cadmium Red Deep, Lemon Yellow, Naples Yellow and Hansa Yellow Deep. I started out with fewer colors. Over the years, I have added some to fill in gaps—notes that I couldn’t hit. Very occasionally, like when I did a series of paintings of pink roses, I will add some colors to help me in a very unusual and specific range, without intending to keep them on my palette long term. *** This is why whites generally come in much larger tubes. Theorists have been arguing for centuries as to whether black and white were colors, or as Alberti claimed, only “mitigators” of colors. For our purposes, let’s call them colors. Originally published July 2015 in LINEA.